Dill is not only beautiful but is easy to grow. The seed is used as a pickling spice and the leaves are used in fresh salads or as garnishes. 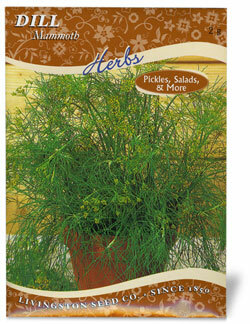 Garden Tip: To harvest dill, cut leaves close to the stem early in the morning or late in the afternoon. To collect the seed, cut stem so that it can be hung and dried in a dark place. Spread paper or bag underneath to catch the seeds.